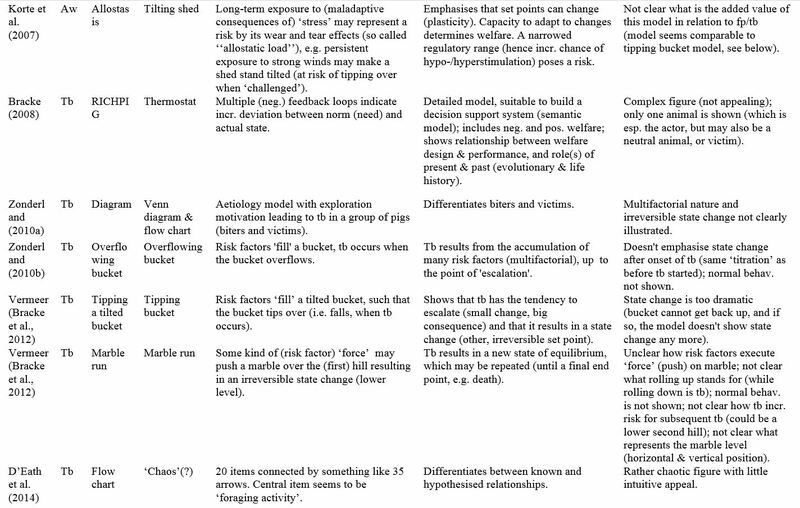 Table 3 shows a list of various models/figures that have been proposed to clarify feather pecking (fp)/tail biting (tb), including the recent model proposed by Brunberg et al. (2016). Our focus here was to compare models, esp. models originating from Wageningen University Research, in search for potential improvements. Not all models have been included in Table 3. For example, Valros and Heinonen (2015) propose a modified bucket model where the bucket is filled with acute and/or chronic stressors (cf also Valros (2017)). Since copy-rights are a problem for representing models, below a selection is given of models for which Wageningen UR (already) has the copy-rights. Other models can be obtained via the cited references or the internet. E.g. an example of the psychohydraulic model (Lorenz, 1950; 1978) can be found here. Figure 7.3 below shows the tail biting (tb) model by Zonderland (2010a) (Fig. 7.3, p. 138). The conceptual framework for tb originating from Bracke (2008) (reprinted in (Bracke, 2017)) is shown in Figure 1 below. 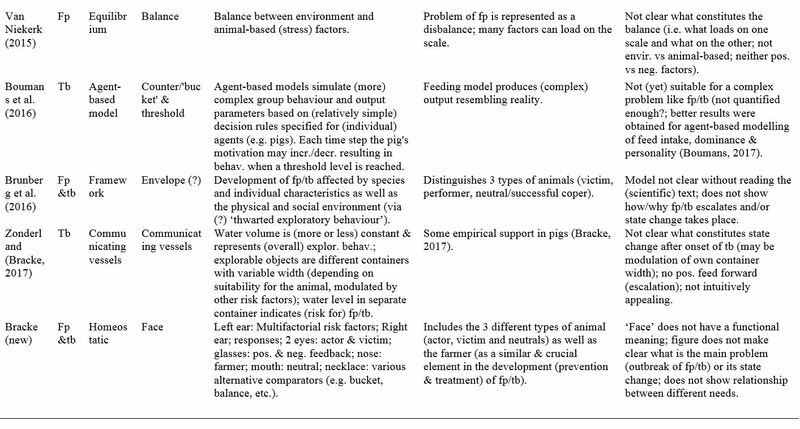 This model was designed to construct the RICHPIG model (decision support system) to assess/calculate the welfare value of enrichment materials for pigs. Figure 1. Schematic representation of the conceptual framework for assessing environmental enrichment for pigs. 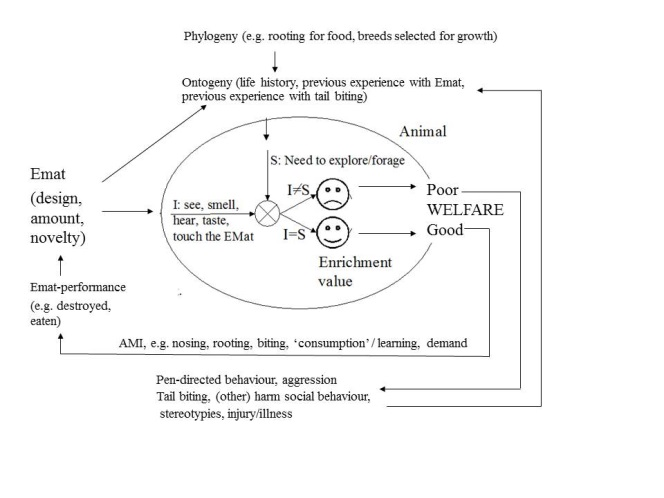 EMat: Enrichment material; AMI: animal-material interactions; I: Istwert, the environment as perceived by the animal; S: Sollwert, set point or norm (modified homeostatic model after Wiepkema (1987) and (Anonymous, 2001)). (Figure from Bracke (2008), permission granted by UFAW) (reprinted from (Bracke, 2017)). 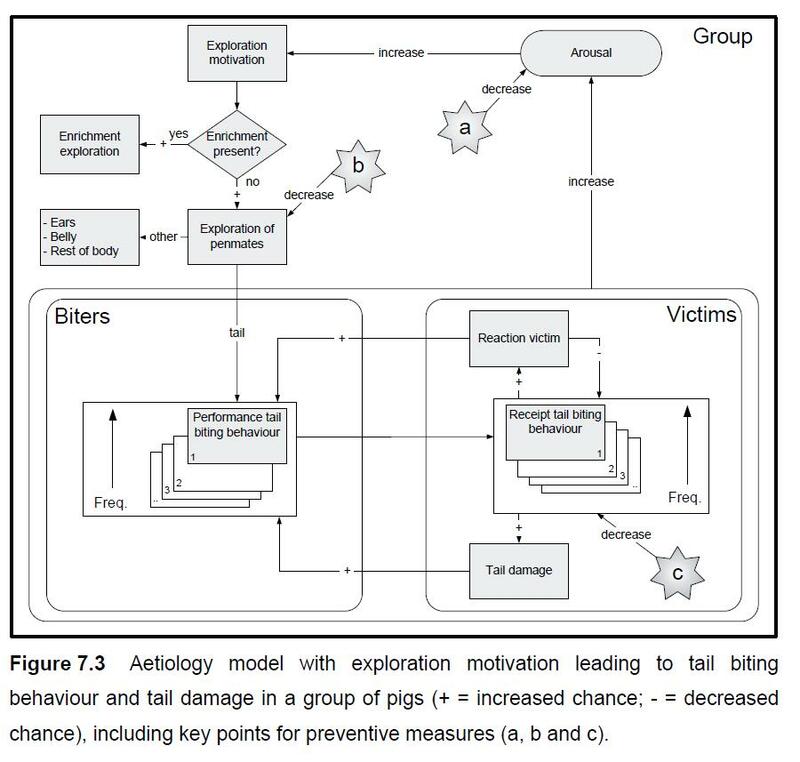 “Progressive feedback loops in the framework indicate that the animal’s welfare is good when proper enrichment satisfies the pigs’ need to explore and forage. When the enrichment is deficient, the animals will redirect their attention and show pen- and pen-mate directed behaviour. Note that this may imply a mechanism resembling the principle of communicating vessels (connected containers filled with liquid; see Wikipedia (2016c)). 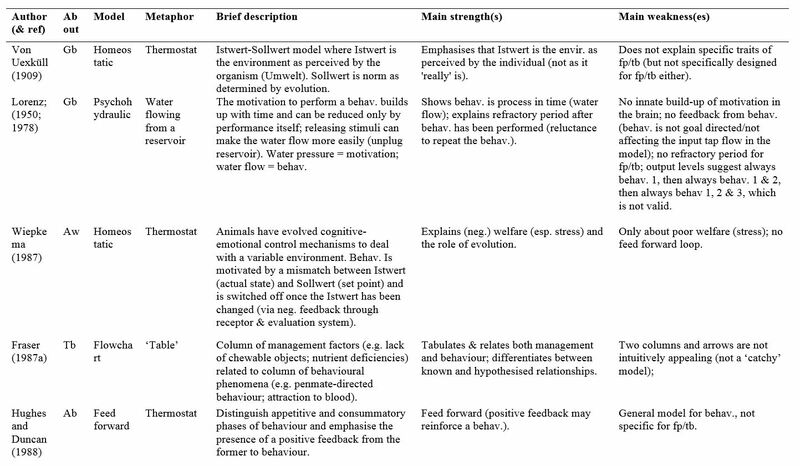 In accordance with this principle pigs may distribute their (motivation for) exploratory behaviour (the liquid) depending on the quality of the manipulable ‘materials’ available to them (cf Bracke et al. (2012)). Eventually, an outbreak of tail biting may occur, potentially evoking a positive feedback loop (an escalating outbreak) leading to cannibalism when no ‘proper enrichment’ is provided buffering and/or eliminating the (primary) cause/stressor.” (End of citation). In the communicating-vessels model, for which we found some empirical evidence in pigs (Bracke, 2017), vessel size may change due to animal-properties like genetics; but also e.g. enrichment-based and other risk factors. In the case of fp in poultry, in a classic paper Newberry et al. (2007) questioned the assumption of communicating vessels underlying the hypothesis that fp is redirected foraging behaviour as proposed earlier by Blokhuis (1986). Newberry et al. (2007) showed that birds with high levels of ground pecking as chicks were more likely to develop high levels of fp as adults compared to low ground pecking chicks. However, the high ground pecking chicks also continued to show high levels of ground pecking as adults, shedding doubt on the theory that fp would replace ground pecking. Under ‘mechanism’ Van Niekerk (2015) presents both a balance model and a tipping-bucket model for fp (see also Van Niekerk (In prep.)). The bucket model was modified from a tb model originally proposed by Vermeer in Bracke et al. (2012). The main problem of the tipping-bucket model is that it suggests that fp/tb cannot stop, cannot be made undone (or perhaps only via an external ‘force’, e.g. a farmer taking adequate measures to correct the problem). Perhaps the model could be improved, e.g. by making a tumbler-type tipping bucket, such that it can be emptied, and then may restore its original position. However, this revised tumbler model would still be deficient in that post fp/tb set points are not the same as before (as a tumbler would suggest). Another option might be a series of buckets. Once tipped, the next bucket could stay down, with the next bucket being smaller, such that the next tipping point would be reached sooner, with preventive measures reducing the flow of water into the bucket. This would solve the issues just mentioned, but it would seem to be a somewhat ‘artificial’/non-parsimonious model. Figure 2. 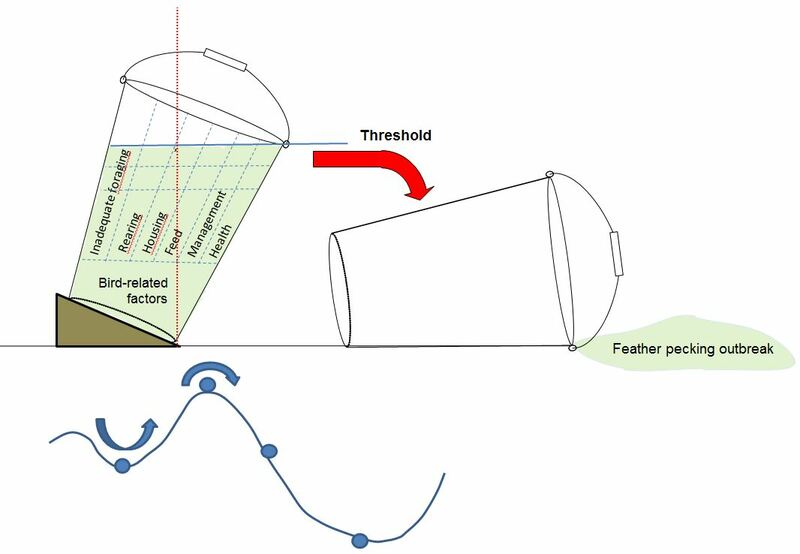 Tipping-bucket model of feather pecking (Van Niekerk (2015); modified after Bracke et al. (2012)). Figure 3. 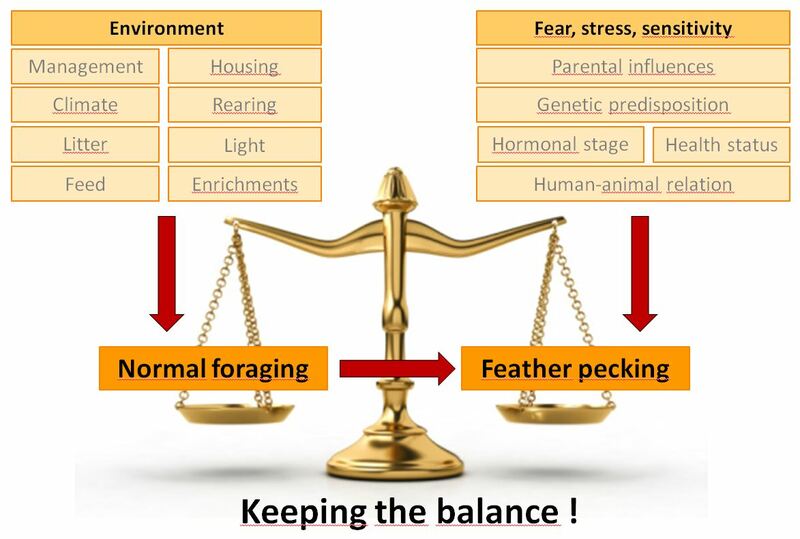 Balance model (Van Niekerk (2015), from http://www.henhub.eu/fp/mech/). Perhaps the balance model could be modified to a balance between ‘fixed’ risk factors on the one scale and management (farmer effort) to reduce tb/fp risk on the other scale of the balance. However, the symmetry in disbalance suggested by the model does not seem to make sense: too much pressure on one side does not have the same effect as too much pressure on the other side. Also, fp/tb does not seem to be (totally) reversible: inducing fp/tb by removing a bit of enrichment cannot be undone by adding the same bit of enrichment (at least not shown). Also, to date no studies are available showing reversibility by adding other factors (e.g. inducing tb/fp by poor litter quality and then ‘treating’ this problem by adding e.g. better feed, etc.). 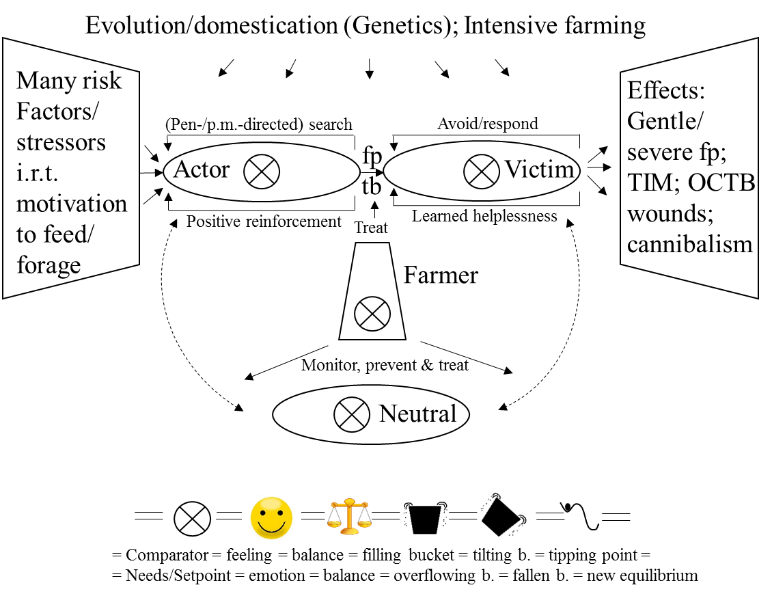 The next figure (Figure 4 below) shows a newly developed ‘face’ model aimed at incorporating the different types of animal involved (actor, victim, neutral), as well as emphasising the role of the farmer (as a kind of ‘actor’) in dealing with a fp/tb problem. The farmer is important for prevention and treatment of fp/tb. The emergence of an animal-actor is necessary to start fp/tb, but the responsiveness of the victim also plays a roll. For example, a victim may more or less effectively avoid becoming a victim and respond more or less in a way that leads to escalation of an outbreak. While a learning process may have transformed actors into individuals predisposed to show the abnormal fp/tb behaviour again at a later stage, similarly, at some point victims may show learned helplessness (which may also more or less permanently alter their behavioural predisposition). Figure 4. New ‘face’ model of feather pecking (fp)/tail biting (tb), showing its multifactorial nature (‘left ear’), the role of different types of animal (actor & victim (‘eyes’), neutral (‘mouth’)), array of responses (‘right ear’), as well as the role of the farmer (‘nose’) in dealing with the problem. Both positive and negative feedback loops (‘glasses’ around the eyes of the face) are involved. Evolution and life history (‘hairs’) determine the set points of the individuals (animals and farmer). The comparators (‘pupils’ etc.) are (more or less) equivalent to welfare (smiley, balance, bucket and marble run) as indicated in the ‘necklace’ below the face. TIM: tail in mouth; OCTB: obsessive-compulsive tail biting; p.m.: pen mate; i.r.t. : in relation to. (Modified after (Bracke, 2017), and incorporating elements of the other models shown above, i.c. the balance and bucket models).